Nothing screams Christmas more to me, then getting all cosy in my pyjamas and settling down in front of the television with some nibbles and drinks to watch a feel-good festive film. I don’t truly feel in the spirit of Christmas until I have settled down to enjoy my favourite festive films. The best way to capture the true magic of these festive films which are so rich in sound and colour, is to invest in a OLED televisions Panasonic. With superior colour contrast ratio, wider viewing angle and improved picture quality you truly can have a cinematic experience at home this Christmas. Which one of my favourite festive films will you choose to watch on the OLED Panasonic TV? Take a look at my top three suggestions, discover where to visit to recreate moments from the films and follow my recipe ideas to create some festive film snacks to help you get cosy this Christmas..
Christmas is the season of love, the time to get together with family and partners. This year you can get that warm fuzzy feeling with my festive film suggestions for the romantic at heart. The Holiday is one of my favourite festive films of all time and I could happily watch it over and over again and never get bored. In fact back in the days of DVD’s we watched our version so much that it wore out and we had to replace it several times, mysteriously the disk kept getting stuck on the iconic ‘Mr Napkin Head‘ scene with the dreamy Graham (Jude Law) – a happy coincidence perhaps? This film features two strong female characters, Amanda (Cameron Diaz) and Iris (Kate Winslet) who arrange a home exchange to escape heartbreak over the Christmas holiday season but ultimately fall in love with Graham (Jude Law) and Miles (Jack Black). And I promise you’ll have the biggest grin on your face when you watch the ending…. Amanda stays in the cosy ‘Rose Cottage’ in the sleepy yet charming Surrey village of Shere. Whereas Iris goes to LA and stays in an extravagant house in a gated community complete with Olympic sized swimming pool. Although ‘Rose Cottage’ isn’t actually there in reality and was made just for the film, you can still wander around Shere and visit the nearby town of Godalming to experience your own Surrey holiday. For my birthday last year my boyfriend and I went to the White Horse where Amanda and Graham have their first date in the film. My brother was even lucky enough to see Cameron Diaz filming when her character goes shopping for festive supplies in Godalming. But where would you choose to spend the festive holiday season Surrey or LA? 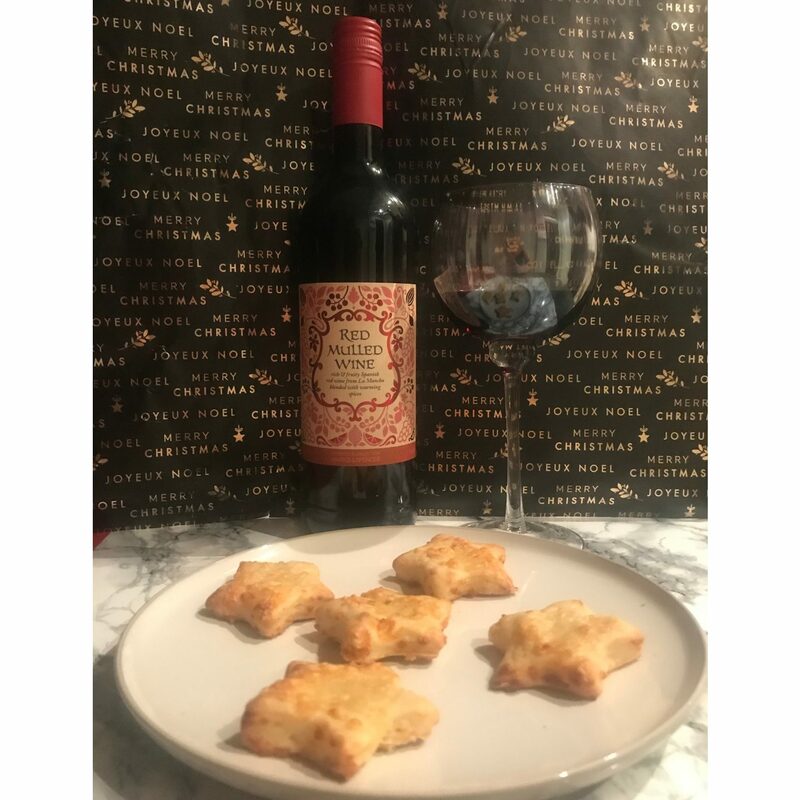 Before watching The Holiday, pour yourself a glass of mulled wine and tuck into a festive cheese scone. Take a look at my recipe below for a lovely savoury treat to enjoy whilst you watch this festive film. Turn the dough onto a floured work surface and knead very lightly. Roll out until 2cm thick then use a star cutter to stamp out shapes and place on the baking sheet. Repeat until all the dough is used up. Shop ’til you drop at the iconic department store Selfridges on Oxford street where Harry (Alan Rickman) shops for a gift for his secret lover. One of the most amusing scenes of the film as the shop assistant’s (Rowan Atkinson) delicate gift wrapping almost has Harry caught out by his wife (Emma Thomson). Or take a stroll around Notting Hill where the most heart wrenching tales of unrequited love takes place. 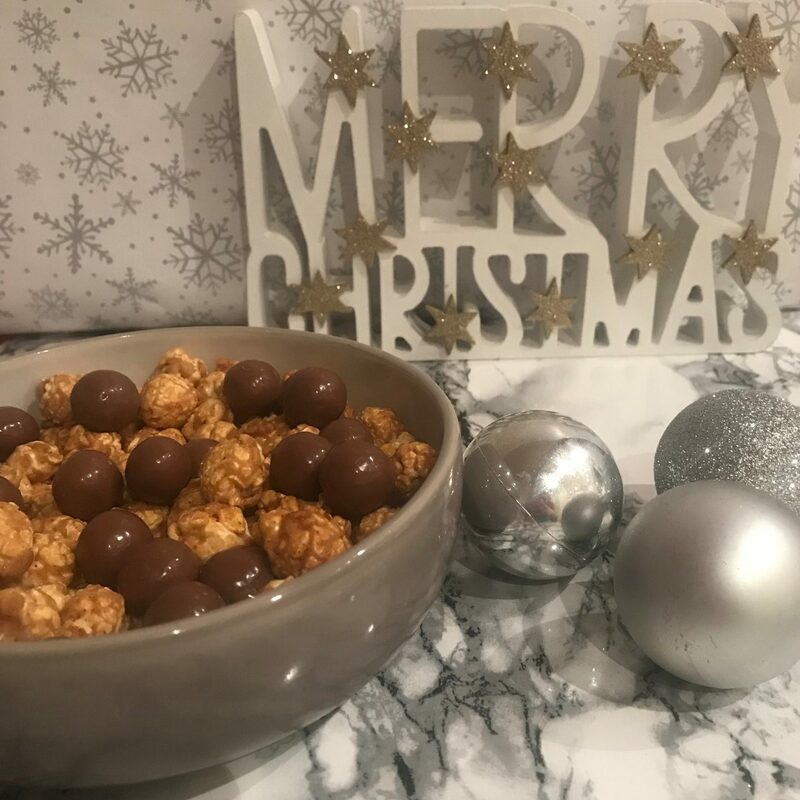 For a super quick and easy festive film snack to enjoy whilst watching Love Actually, grab some popcorn and then add some Malteasers. I’d highly recommend the Joe & Sephs Peanut Butter flavoured Popcorn that came in my ‘Jingle all the way’ Prestige Hamper. It isn’t Christmas until I’ve watched Elf. We all know ‘the best way to spread Christmas cheer is singing loud for all to hear’. Buddy is raised in the North Pole by Papa Elf, however as time progresses it soon becomes apparent that he is a human who thinks he is a Elf! He heads to New York to find his real father and encourages those he meets along the way to embrace his childish innocence and love of everything that Christmas represents. Head to the Big Apple, the city that never sleeps, the concrete jungle where dreams are made of – New York City. My favourite city in the world and the iconic setting for numerous films and TV shows. Aside from the feature of the North Pole, the majority of the film is based in New York. Including skating on the famous Rockerfeller ice rink, the Empire State Building and Central Park. Who could forget the scene when Buddy working as a Elf in the Toy store yells out in disgust ‘you’re not santa! !’ or the magical moment when everyone’s singing allows Santa’s sleigh to take off from Central Park. Ok I admit I run round those revolving hotel doors just like Buddy….. 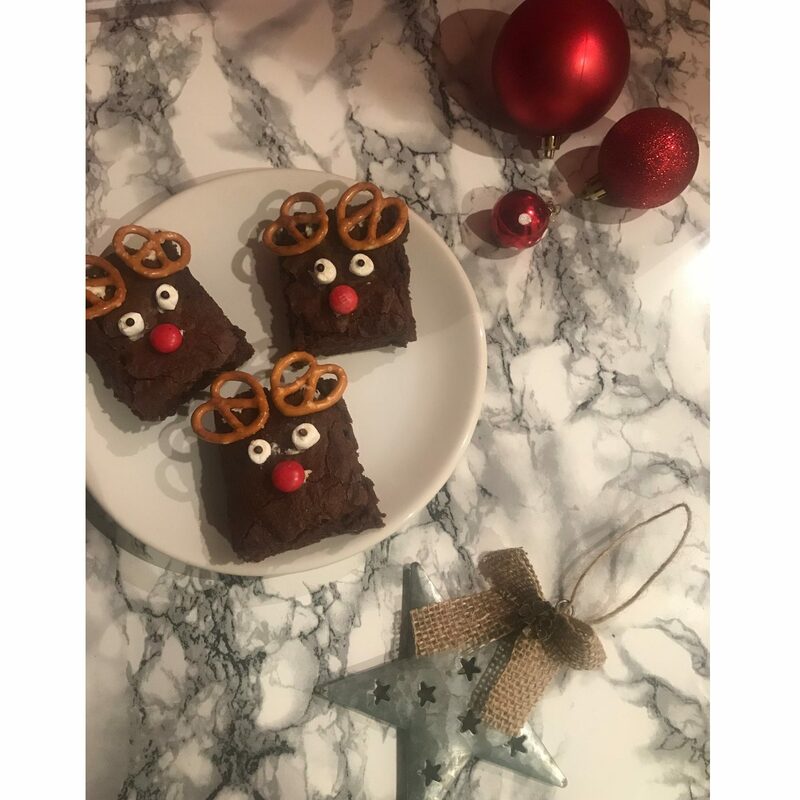 These fantastic Reindeer Brownies use my favourite Hummingbird Bakery recipe but include a festive twist so you will need pretzels, M&M’s and marshmellows to decorate this adorable snack to enjoy during your festive film evening. Why not make a wobbly Hot Chocolate? (It has baileys in it!!). 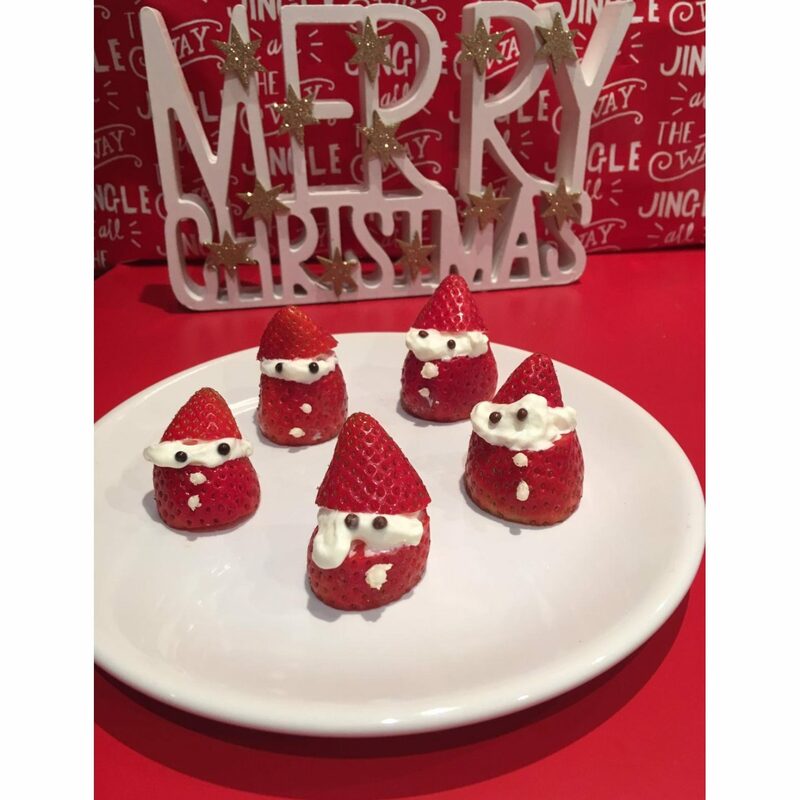 Another cute Christmas snack to make for your festive film viewing will be a favourite with all ages the charming Strawberry Santa’s. Very mischevious these santas will quickly disappear so eat them quick! I could go on and on and list countless festive films. But to cut it short my other favourites include Home Alone, Arthur Christmas and Singing in the Rain. Wait hold on a second I hear you cry – Singing in the Rain a Christmas film? So technically it isn’t a festive film, but it is one of the most incredible films you will ever see, plus it holds a special place in my heart. As me and my family watch it every year, a tradition that started with my mum watching it with my Grandad when she was younger and its carried on every since. 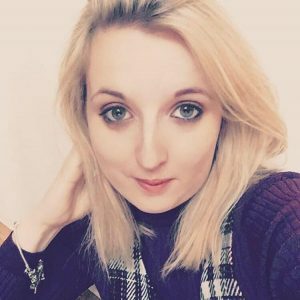 This has been my favourite blog post to write so far, it was so much fun! I literally spent the whole time I was baking and typing this with a massive grin on my face – So I hope these festive films and the snacks bring you joy. As that’s the true magic of Christmas (well that and the yummy food!) If you are looking to find the perfect Christmas gift take a look at my feeling festive ideas. Thanks for reading, let me know in the comments below what your favourite festive film is. The UK Blog Awards are still open so please do vote for me via the link in the image below.